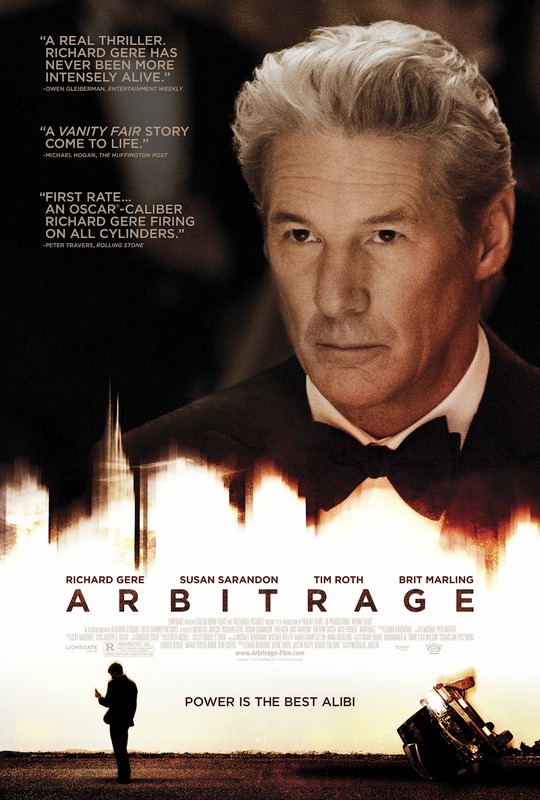 On a positive side, ‘Arbitrage’ builds tension well, especially in the beginning. It is an intense and interesting watch, and, thanks to Gere, we see some very dramatic performances and interesting plot developments. However, strangely enough, as this film goes on it starts to disappoint. It becomes more predictable and overly dramatic, and would have sank beneath the mundane and ordinary but for Richard Gere’s breath-taking portrayal of a man on the brick of a nervous breakdown, and his supporting cast, which includes amazing Susan Sarandon, as Miller’s wife, Ellen, as-laid-back-as-ever – Tim Roth, as detective Bryer, and a relative newcomer, Brit Marling, as Miller’s daughter, Brooke. Seeing Gere’s performance it is amazing to know that he actually replaced Al Pacino at the very last minute, just before the start of the film’s shooting. Though Al Pacino would also have made the best of this role, Gere is probably a better choice. This is because Al Pacino’s ‘mob history’ still clings to him despite all odds (as do his corresponding looks), and that impression would have given the character of Robert Miller away. Rumours have it that Eva Green (“Dark Shadows” (2012)) was also attached to the film to be cast as Robert Miller’s lover, Julie, the role, which eventually went to Laetitia Casta. We probably have all seen ‘rich-and-successful-man-got-into-trouble’ films and even read some excellent books popularising that theme. One great novel here is Tom Wolfe’s ‘The Bonfire of the Vanities’, portraying a rich Wall Street worker in the 1980s New York and his subsequent fall from grace. ‘Arbitrage’ follows a similar plot to Wolfe’s novel, but with a different finale. Interestingly enough, the 1990 film adaptation of ‘The Bonfire of the Vanities’, starting Tom Hanks, Bruce Willis and Melanie Griffith, proved to be a critical and commercial flop, decade later being aired only in the countries of the former Yugoslavia with some relative success. The weakest point of ‘Arbitrage’ is probably its ending, which is a typical John Grisham ending, meaning there is no satisfactory ending at all. The film manages to build enough anticipation for the audience to feel underwhelmed by the end. Although, it is also fair to say that the ending is in no way unintelligent or without a drop of some clever aforethought. Nice review. I’ve heard a lot of good things about this movie but I’ve never stopped to take time and watch it. Gonna have to. Thanks! Hope you like it, it’s worth a watch, just for the cast, performances and sporadic thrills if nothing else. I haven’t watched this one. Your comments regarding the ending probably go a long way to explaining why the film didn’t do well at the box office. Great review. Will try to catch this when it surfaces in the UK. Thank you. It will also be very interesting to hear your thoughts on this one. I’ve come across this so many times but kept choosing another one instead. Predictable huh, that’s too bad. It seemed like it could be from the trailer but I was hoping it would still be suspenseful. I enjoyed the acting in this film.